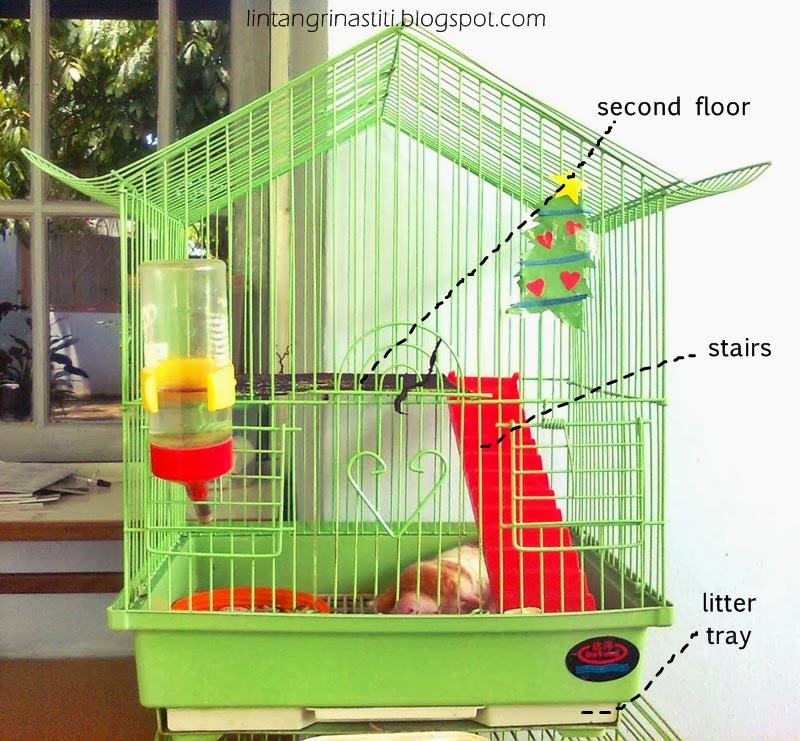 Before you decide to have a hamster as pet, you have to prepare the cage. You can purchase a wire cage, or make it yourself. You can also use a fish tank, or modify a bird cage like I did. 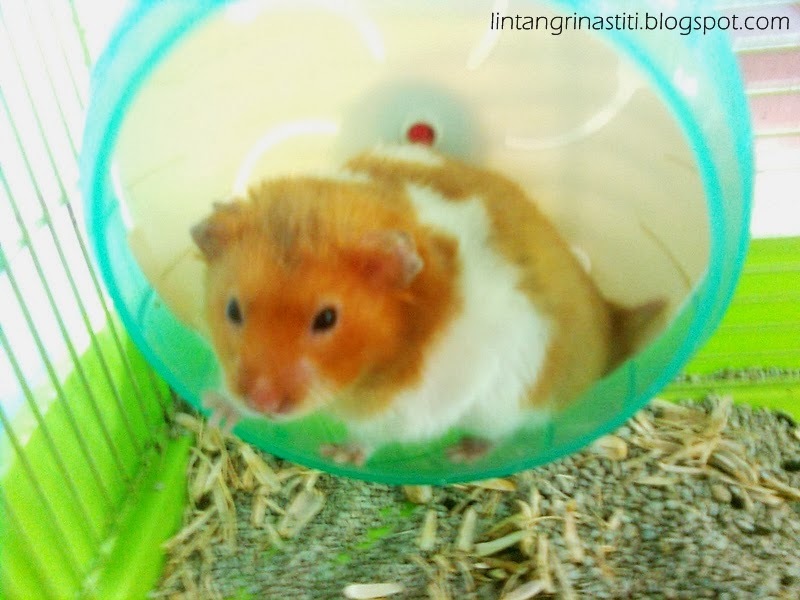 Hamsters live in a hole in their natural habitat. They love to hide & sleep in a dark place. 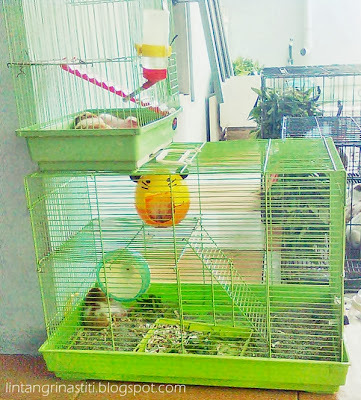 If you don't provide a hamster house, they will sleep under the wheel, water bottle, or another objects as long as it's shaded. 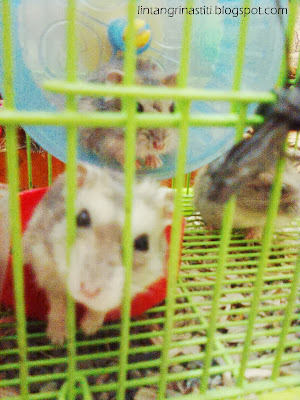 Hamsters have instinct to save their foods in one place, they will collect the foods even if you don't provide hamster dish. 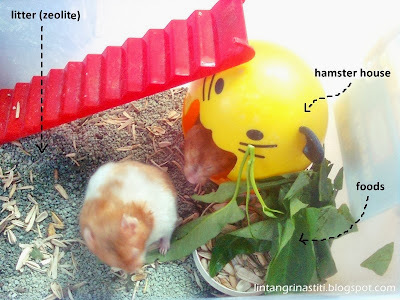 Heavy dish (from porcelain) is better because hamsters tend to overthrow the dish. Or you can use wide plastic tray instead. 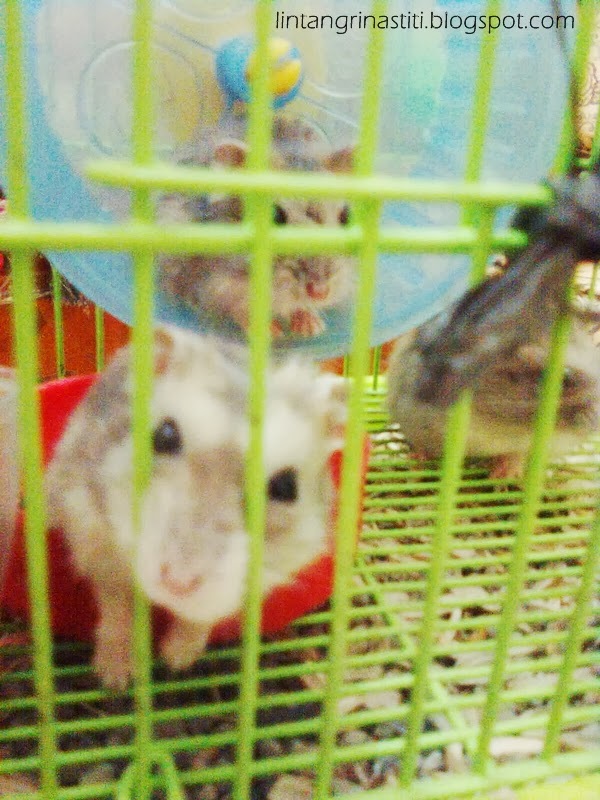 Hamsters, especially the Syrian breed, prefer their foods put on the floor. The best litter/bedding for hamster is zeolite, because it can absorb fluid fast & control the odor. Zeolite is washable, so it's very economical. 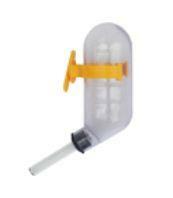 Choose the medium size of zeolite, not the fine one. Fine zeolite texture is almost like sand, urine will cause clumping to it. 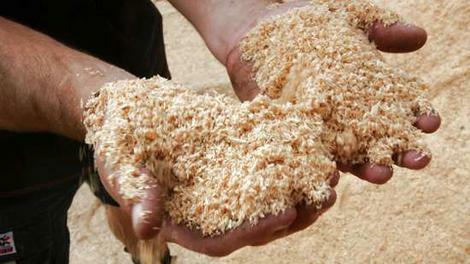 Personally I don't recommend sawdust because the odor control is bad & it gets wet easily. Moreover, sawdust is not washable. 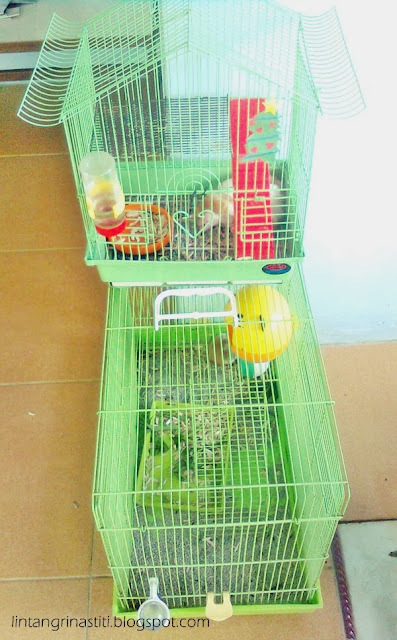 Well, here are some pictures of my hamster cages..
Hamsters are nocturnal, they're active at night. They sleep at daytime under the stairs because there's no hamster igloo. Both cages look similar, eh? 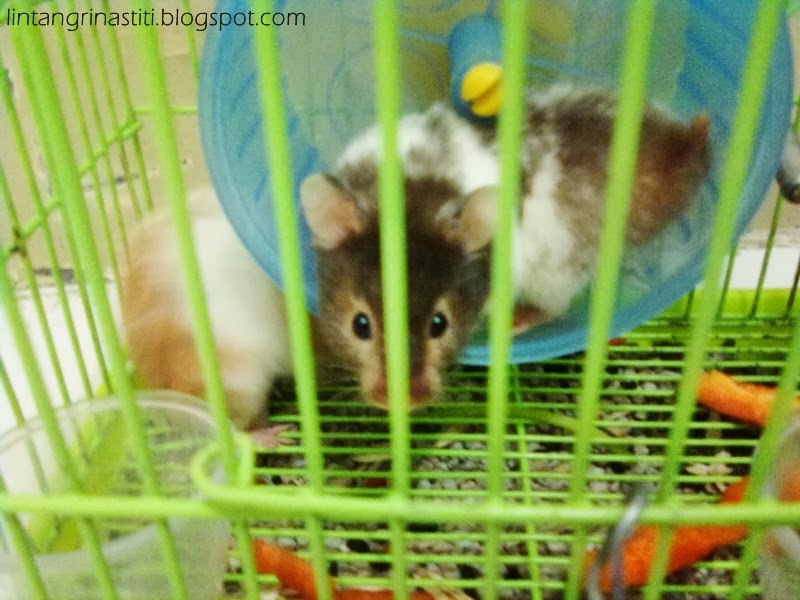 Bye.. see you in the next post!